How to make pizza dough in a food processor - fast! Our easy pizza dough recipe takes less than 5 minutes to make with a food processor. Best of all, it's foolproof! This recipe makes enough for 2 15-inch pizzas. Too much? Freeze half the dough for another time. Or just halve the recipe. A little whole wheat flour enhances the flavor of this versatile pizza dough, and olive oil adds real Italian flair. Once you know how to make this easy pizza dough recipe with a food processor, you can make pizza at home any time you want! Just use one of our seafood pizza recipes or add your own topping, and bake at 425° until the crust slightly browns and the topping gets bubbly. Traditionally, bakers add yeast and a little sugar to warm water to dissolve and "proof" the yeast for 10 minutes before adding to other ingredients. This activates the yeast, which turns the water foamy - "proof" that the yeast will make your dough rise. We find that you can skip this step if your yeast is fresh, since it activates naturally as you're mixing the dough. Add the white and whole wheat flour, salt, olive oil, yeast, and sugar to the food processor. Turn it on. With the motor running, slowly add the warm water to the food processor through the top tube until the dough forms a soft ball. Process for another 1-2 minutes until the dough looks elastic. Put the dough into a large oiled bowl, cover it with a dish towel, and let it rise in a warm place for about 1 hour. It should be about twice its original size. Spray each pizza pan with cooking oil. Divide the dough into 2 balls, and use your hands to press them into flat discs. Sprinkle some flour on your rolling pin and countertop. On this floured surface, roll the first ball of dough from the center outward to form a circle approximately 15 inches in diameter. Carefully lift the dough (drape it over your rolling pin if necessary) and spread it across one pan. Repeat the process with the second ball of dough. Or, if you want to make only one pizza, you can freeze this second ball for later use. Put it into a plastic bag, squeezing to get all air out of the bag before fastening it closed. It will keep for about a month in the freezer. Wondering about the best way to top off our easy pizza dough recipe? 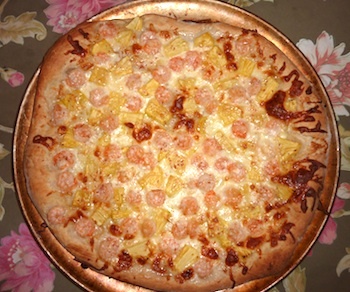 Check out our recipe for delicious pineapple and shrimp pizza!